Thanks for posting this! I'm 98** so anxiously watching these threads. Unconfirmed analysis: Anecdotal reports that their production hit a minor snag which would explain the current dip in production (however FM's customer service reassured us that they're already back into production). Pushes back the forecast a little bit and FM pushed back their ETA on gold members by a week (http://community.onewheel.com/post/37506). Likely that new shipments will happen Friday, otherwise might need to wait until mid-next week for new shipments to occur. Great charts - thanks for doing this for everyone's benefit! Production has slowed down as expected and should pick back up sometime this week, according to FM's customer service latest estimates. The exponential and linear trend lines are starting to converge, which should give you a more accurate guess. FM is still hoping for the majority of orders to ship before June. 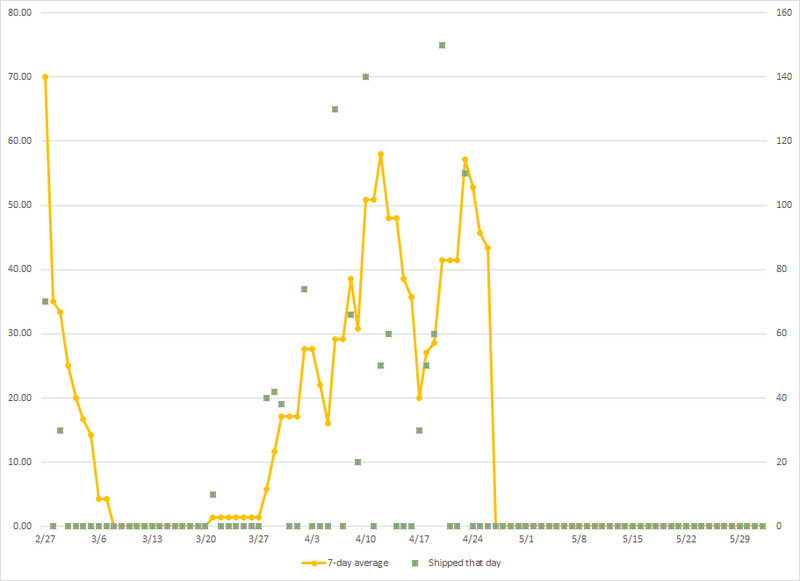 To guess your estimated ship date: Plot your order number on the Y-axis and look where the trendlines fall. 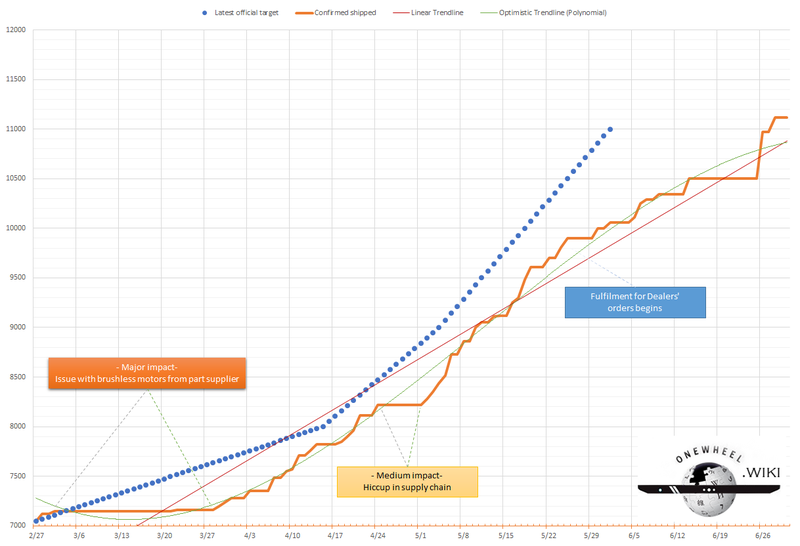 It'll give you very approximate estimates of a optimistic ship date (green line) or a more conservative prediction (red line). Flattening of the curve. Boo! @crawcraw new shipments today!!! I'll update the chart at the end of the day but I'm glad they already started shipping this week and it's only Tuesday! Ordered on 08 January, got it today 02 May. That said, I asked for delayed shipment as I was out of the country in mid April for a couple of weeks. Ordered Gold Edition on Jan. 7th...and it arrived last Sat. April, 29. Fender arrived today. With both of my Onewheel orders, they kinda lamed out with 'premature notification' and yeah, you know what I'm getting at. Both times telling me the board was on the way, only to back-track and tell me later it was delayed. But hey, in both cases they gave me some apology-shwag and with an board sport this damn fun to ride, I'll put up with a little shenanigans..